I'm here, to draw a winner of our AUGUST "fun in the sun" Challenge. 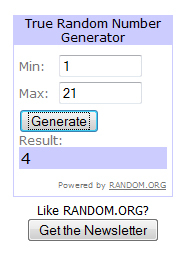 I used Random.org to pic a winner. #4 is Shanna ! Congrats! Please email (lora at onecrazystamper dot com) to claim your gift certificate. And feel free to grab our "I shop at OCS" badge for your blog. Thanks to all who joined this month. We'll be back tomorrow with a new challenge and TONS of prizes all month long for our Grand Opening Celebration! Hi Everyone...so glad you stopped by the OCS Blog today. 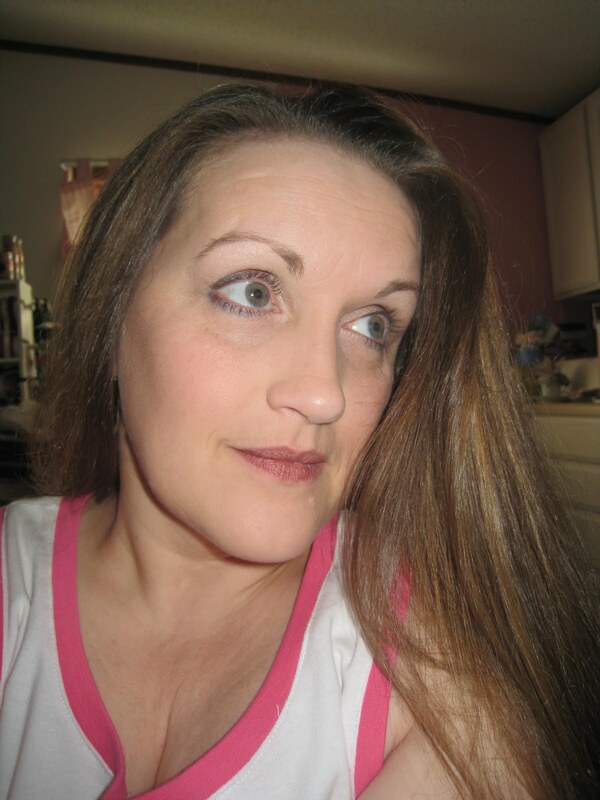 I am Lora the owner of OCS, you might just find me posting on the blog every now and again. 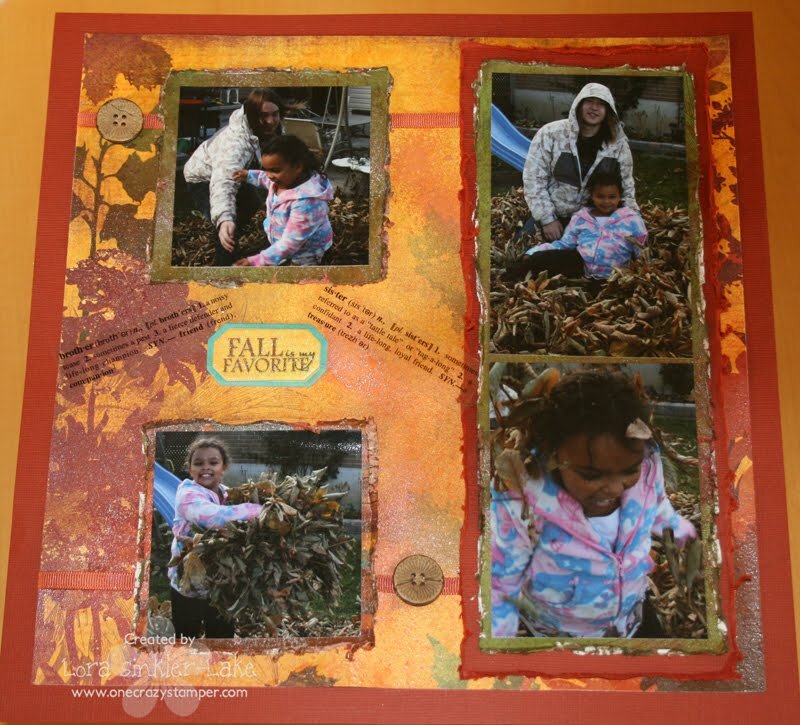 Today I have made up this 2 page layout using the new Bo Bunny Forever Fall papers...oh gosh I'm in love with them. When this paper arrived in the store some went directly into the Lora stash bin. I thought it would take me forever to get around to being able to use them with the Grand Opening of the new OCS brick and mortar store coming soon...but....I found the time...somehow. The story behind the pic's.....We have this beautiful chestnut tree in our backyard..okay it's beautiful till the leaves dump in the fall and we need to rake up 12 bags. So we came up with this "Family Tradition" when our daughter was 3 to make it a family leaf raking day. Our son Rian who is 12 years older than his sister didn't think the "Family Tradition" thing was very cool...simply put, to him it was just work! But judging by the pictures I take every year of this little event they have a great time!! This set of pic's goes back to 2008...yes I'm that far behind..even further actually but oh well. I have used a ton of distressing on this layout along with Goosebumps & Fireworks (Desert Sand Rhubarb Stalk & Rich Cocoa). I also added Frayed Burlap Distress ink to all the edges of the distressed areas. The Goosebumps really adds some wonderful texture and sheen to the paper & I really like that. The ribbon was sprayed with Fireworks as well. Hope you like it!! Don't forget to check out the awesome Blog Candy we are giving away this month to celebrate my new store opening...you can find it HERE! 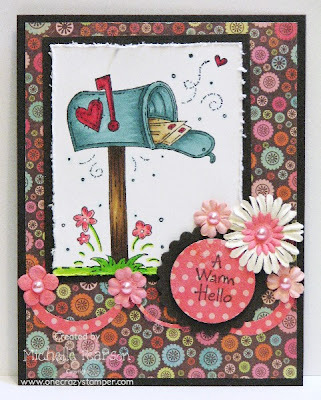 Today's card is featuring an image from Whimsy Stamps called Mailed With Love. It's such a happy little mailbox....and is so fun to color. I used the following Copic markers: BG75, BG72, B000, R39, R37, R35, R32, G07, E59, E57, E55, E42, E41, YG17, YG03. Designer papers are from My Mind's Eye's Tickled Pink Collection. You will want to check out the fabulous blog candy that Lora is offering in celebration of her new store opening...the candy is valued at $175! 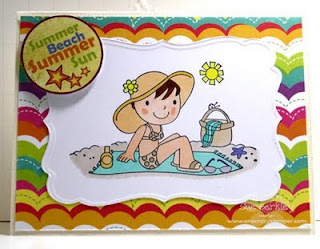 For my post today I used this adorable stamp called Summer Day Emma by Whimsy Stamps. You can see the new Whimsy On-Line Magazine #2 at One Crazy Stamper. Do take advantage of Lora's amazing deals in the the Summer Sizzler Sale which will soon end, and go to Grand Opening Blog Candy for a chance to win the amazing prize. The brick and mortar grand opening is Saturday, September 10th. Join us for our September challenge for a chance to win fabulous prizes!! Hey all! OK so I have not stamped in over a month (Pause for gasp). Yes, you heard me correctly...a month! We moved so I had to pack up my stamp room and we downsized so I no longer have my own room like I had before but I share my stamp space with my husbands now defunct man cave. To put this into perspective four years ago I met my husband and I had just started this hobby and when I would come and visit him on the weekends (we lived an hour from each other) I would bring ALL of my stamp stuff with me and that fit into a rolling case and almost a year later when we moved in together I was still stamping out of a cardboard box in our dining room. then we moved and I had my own room. 2 and a half years later I am back to sharing but now my husband has 1/4 of this room and the closet and I have 3/4's of the room with wall to wall shelving. As we were unpacking he looks at me and says "what happened to the cardboard box???" Neither of us realized how much I have accumulated until we had to pack and unpack it all! the reason for my story is because of the smaller space it was harder to find boxes to be able to stamp so i was putting it off and putting it off until (gasp again) I had a card due this weekend and I had no idea where my ink was packed let alone where my stamps were. they have been safely rescued and I was able to put my desk together enough. I still have boxes to go through and lots and lots of stuff to organize. I also have realized stamping is like almost anything and you need to practice and I realized that as I was a tad rusty with this project! UGH I am rusty! 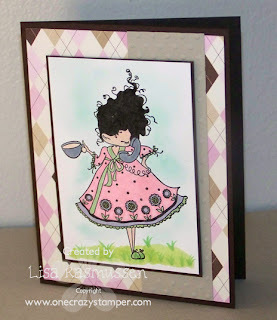 I used Stamping Bella Lulu's morning fix! ADORE this image! I also was lucky enough to receive a HUGE box of yummy stuff from the store! My birthday is Sunday and since it is a biggie (the BIG 3-0) I told hubby all I wanted was an excessive allowance to spend on whatever stamp stuff I wanted. After the above conversation he looked at me kinda crazy but agreed and I ran, not walked, to the store site to take full advantage of the Summer Sizzler sale!!! My order arrived yesterday and I was pulling out soooooo much stuff! I stocked up on my lala's, kraftin kimmies, and nesties! hurry and take advantage now because these prices are simply fabulous! also scroll down for the HUGE blog candy celebrating the brick and mortar store!!! Today I have this adorable image from Your Next Stamp called Picnic Ellie. What a fun beach scene. I colored my image with copics:YR15, YR16, YR18, B21, B24,B26, E30, E31 and airbrushed the background with B21. Then I cut my focal image with the Label 4 nestie. DP and bling is Bo Bunny Barefoot & Bliss. You still have time to enter our monthly challenge. One Crazy Stamper is opening a brick and mortar store. 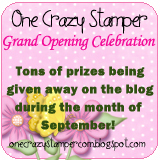 And we will be celebrating on the blog by giving away prizes galore during the month of September!! You won't want to miss this. *** For a 2nd entry- Post our blinkie above and put it on your blog. Link it to www.onecrazystampercom.blogspot.com. Add your name into Inlinkz a 2nd time. We will draw a winner Sep. 26th on the blog. Be sure to check back frequently during the month of September!! Hi all, Madge here for another wonderful Wednesday showcase. 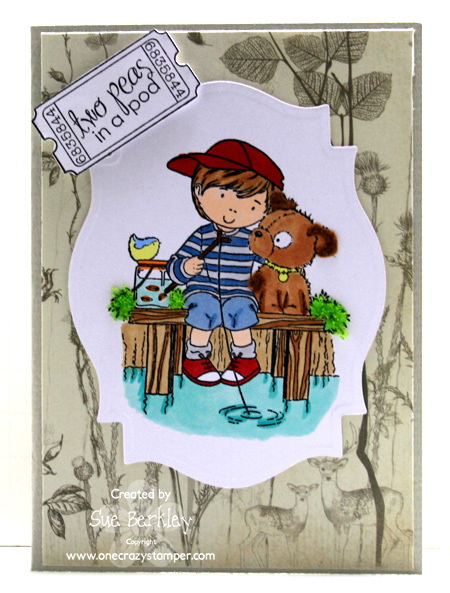 I’ve chosen to use a wonderful little summer image of Isabelle with puppy by Sara Kay for Stampavie. I love these images as they are loaded with so much detail. I wanted my image to literally “pop” off the page – so I cut out the main image and layered it onto the same stamped image, leaving all the fussy details in the background. 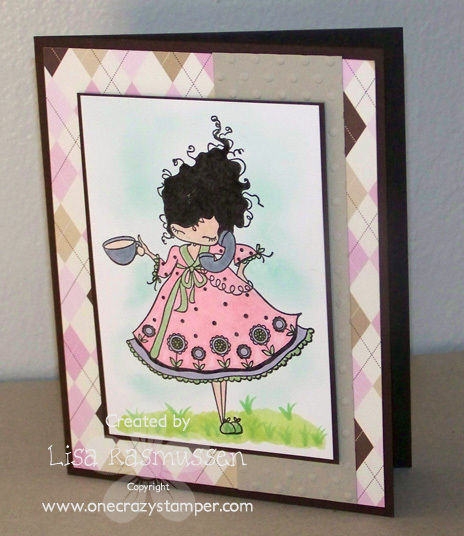 The background was pre-colored by sponging with Tim Holtz Distress Inks (Broken China and Peeled Paint). I added highlights for the grass and flowers. I had colored this image a while back, so the search was on for the DP’s to match. I found them in my 6 x 6 stash from “A Walk in the Park” collection. Supplies used: Xpress It blend cardstock; Memento, Tuxedo Black ink; Copic Markers; Tim Holtz Distress Inks; EK Success Border Punch; DP’s from “A Walk in the Park; Flowers and Ribbon from stash; Misc SU Cardstock. OCS is only days away from opening an actual Brick and Mortar Store!!!!! That means LOTS more “STUFF”………Prizes will be given away to celebrate!!!! Become a follower of OCS and there will be wonderful surprises in store for some persons!! And there is still the opportunity to join the OCS challenge for the month of August “Fun in the Sun” to win additional free stuff!! Because I stamped with lighter ink I was able to take great liberties with her eyes. I used a sepia copic multiliner pen to add her eyebrows and lashes. I also used a black copic multiliner to do all that detail on her wings. I really wanted them to look like monarch wings. My papers are Cosmo Cricket PixieLicious. She was cut out with Spellbinders Nestabilites in both Circle and Scallop circle. 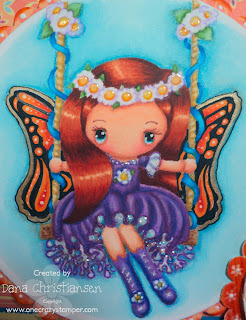 The finishing touches were some Tim Holtz Distress Inks in Spiced Marmalade and some Stickles. I used 1 inch and 1 1/4 inch square punches for my background. The smaller squares are popped up on foam tape. The white oval has been run through my Xyron machine and covered with glitter. I stamped, colored and fussy cut my main image since she was a tad taller than my white oval. 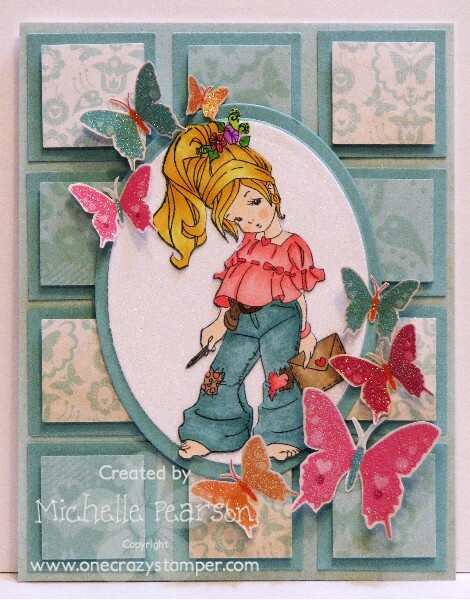 The butterflies are fussy cut from a fun sheet of glitter paper from the paper pack I listed above. The blue squares on my background have glossy accents as well. 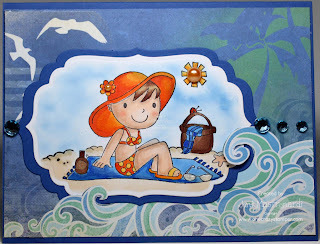 Hi, it is Sue here and I have used this cute stamp Picnic Ellie by Your Next Stamp to share with you today. I cut the sentiment Summer Beach Summer Sun out from a sheet of paper from the Beach Bum paper pack. There is still time to enter this month's Fun in the Sun challenge for a chance to win a $25.00 gift certificate. Don't forget to circle September 10th on your calendars. 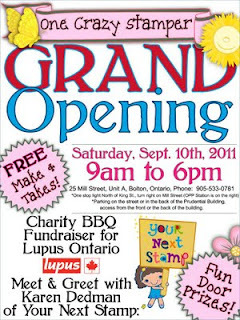 It is the day of Lora's grand opening for OCS' brick and mortar store. I am LOVING these Kenny K images! They are so fun to color and the girls are sooo sassy! A lot of the masculine images out there are for younger guys and boys but I love that this image is perfect for the older guys in our lives! 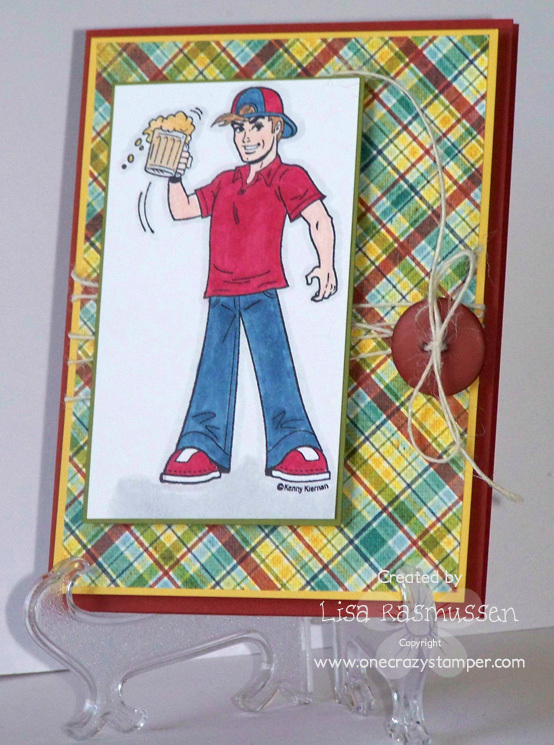 I kept this card simple and just added some linen thread with the button. I wanted this card to be masculine so I did';t add to many frills to it. Today I have this hilarious stamp from Art Impressions: Girlfriends In the Tub. I stamped it with Memento Tuxedo black ink on Xpress It card stock. 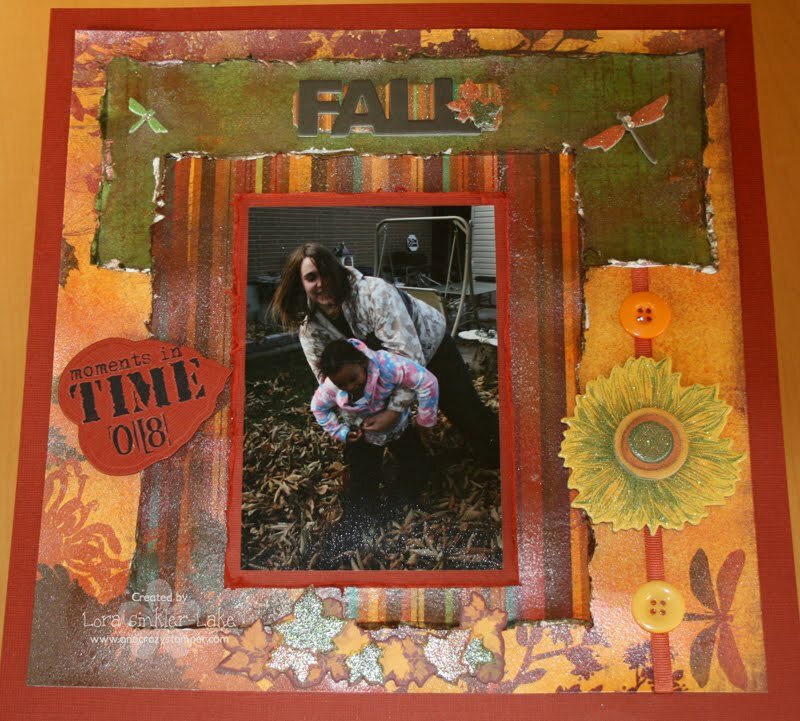 I paper pieced most of my focal image. However, as you can see from the picture below I did use a few copics. on some dp called Beach Babes by Fancy pants. I added some bling and there you have it! 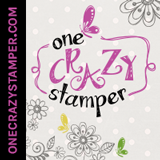 Check out all the amazing products at One Crazy Stamper! Hello thanks for peeking in, I have a tag card to share with you using this stunning image from Whimsy Stamps by Crissy Armstrong called Journey into the Sea available at the OCS online store along with all your Whimsy Favorites!! I stamped my image on Xpress it cardstock with Memento Ink then I colored my image with Copic Markers. I really wanted to add lots of deep highlights!! My sentiment is also from Whimsy and is also available at the OCS Shop, these sentiments are really versatile and I have used them tons!! And a Wonderful Wednesday to all. 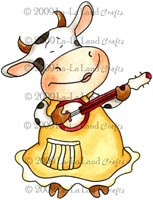 Madge here, with a La La Land Crafts image called Banjo Maya. I must admit, this one had me stumped – but here is what I came up with. I stamped the image onto Xpress It blend cardstock (especially for copics), and dug in with my copics. C0; C1; C4, W0; BV23; BV25; BV29; BV31; R00; R95; Y18; G07; and BG24. The Designer Paper is from a BoBunny “Ad Lib” 6 x 6 pad which I thought my Maya needed to brighten her up. I decided to make a run for crazy colors to change her from drab to “fab”! lol When I got finished with the pleats on her dress, I thought she looked drab, so I drew in some polka dots and colored them to match the paper. Excuse the pun – but Cow-a-bunga! Just what Maya needed. This is one of TWO posts today....so be sure to check out Dana's post for more inspiration!! This card is for One Crazy Stamper, and it features a beautiful set by Our Craft Lounge called The Art of Nature. 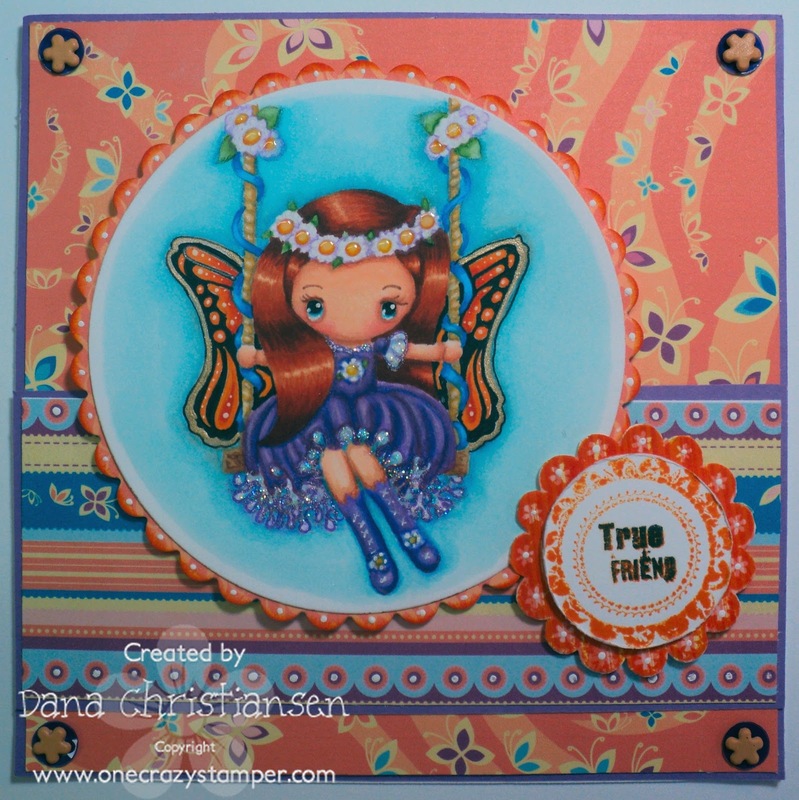 I used designer papers from Prima's Moulin Rouge collection, which is not an obvious choice for this image, but I like the variety of designs in the Prima Collections. There are 48 pieces to a pack, and right now Lora has them on sale....the Reflections collection looks like it has some similar papers in it...check them all out before they are gone!! Hi all!! Dana here and for those of you that have visited my personal blog it is no secret that I am a huge fan of Mo Manning's amazing artwork! She captures attitudes like no one else. Case in point, check out this beach babe! Her name is Little Umbrella. 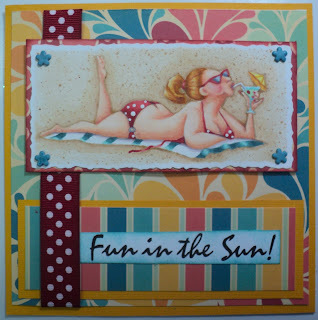 Isn't she perfect for our Fun in the Sun challenge? That sentiment is from Pink Cat Studio. My papers are from Cosmo Cricket Salt Air. My coloring is with Copics and for a twist this time she was stamped with Memento Ink in Desert Sand. 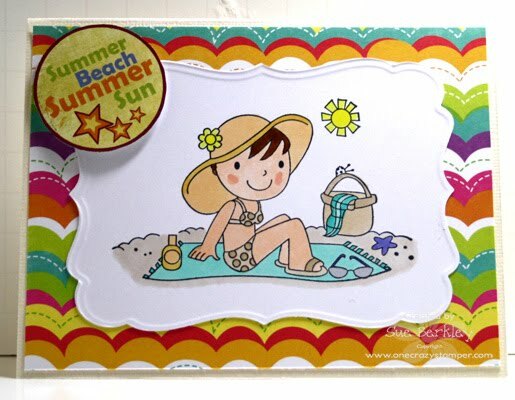 Don't forget, you still have plenty of time to get in our Fun in the Sun challenge this month!! Hi, it is Sue here and for my post today for One Crazy Stamper, I have used this adorable stamp from Stampavie called Fishing Fun; a boy with his best friend. Don't forget about the Summer Sizzler Sale that is now running until August 28th. 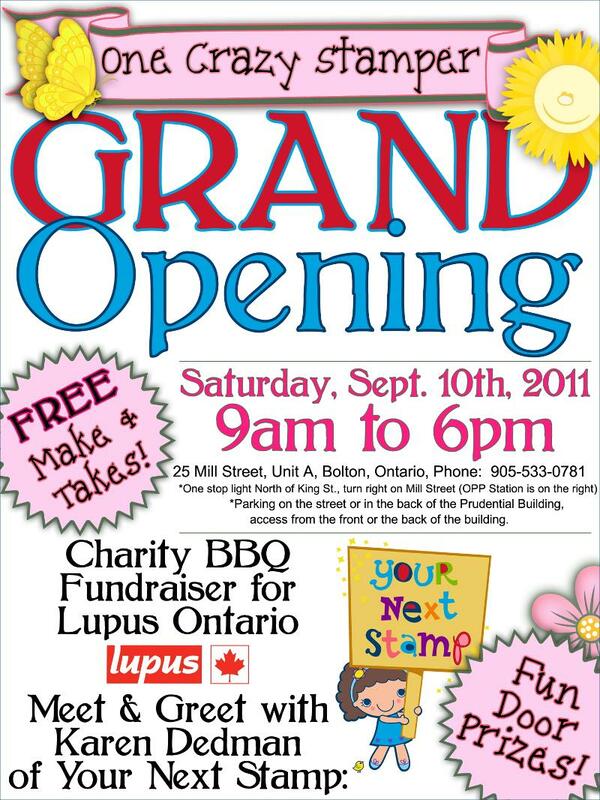 Do circle September 10th on your calendars as it is the grand opening of Lora's One Crazy Stamper brick and mortar store. 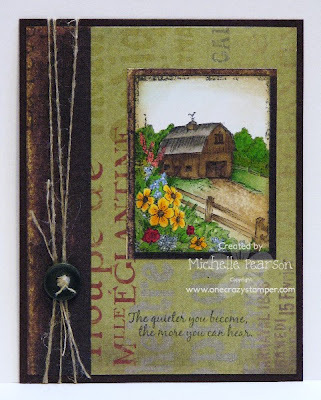 Today I have a great card to show you by our August Guest Designer Rhonda Davenport. 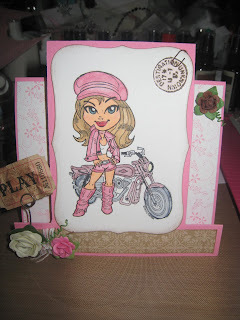 She used this Whimsy biker girl stamp to make her step card. 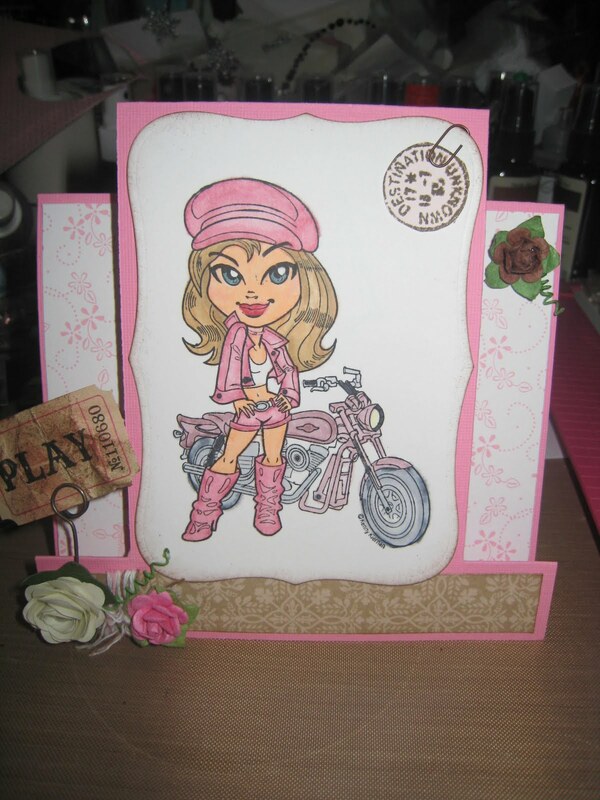 I love the pink paired with this biker girl. Great card Rhonda! Please hop over to Rhonda's blog to check out he details of this card. Thanks for joining us this month Rhonda! Hi all! It has been a super busy end of summer here! We recently moved and downsized and boy was that a process! My stamp area is in a bit of a chaotic status but thankfully I worked ahead before packing things up! 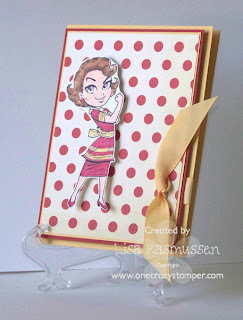 For this weeks card I used Super Mom from the Kenny k collection over at One Crazy Stamper. 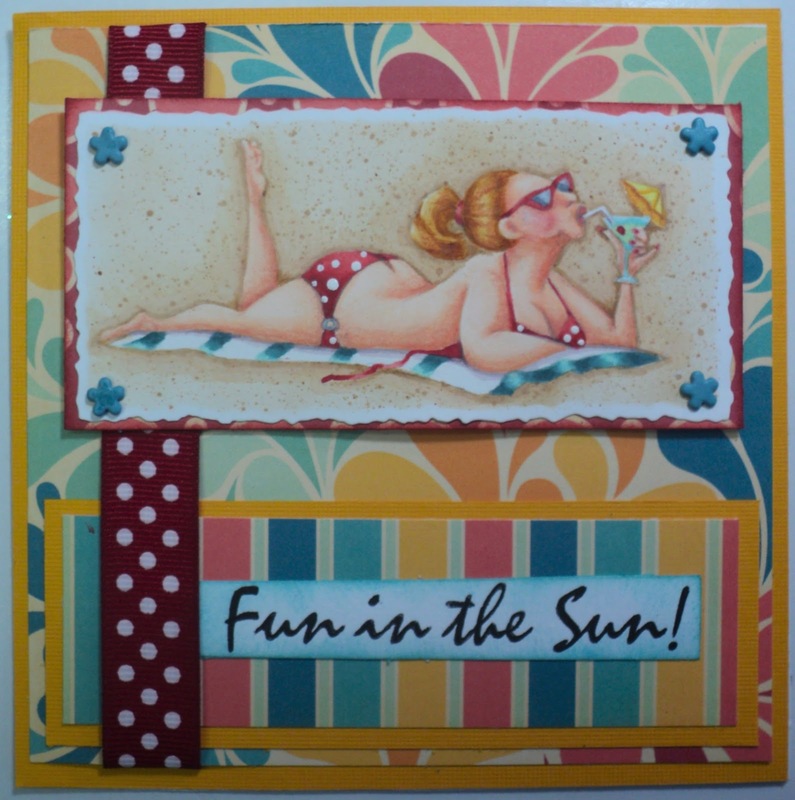 This months challenge is fun in the sun so I made sure to use some pretty yellow on my card. I love using this shade of red with the soft yellow. One of my favorite color combos!!! Happy crafting and join in with this months challenge! Also, check out the Summer Sizzler sale!!! TONS of GREAT products marked super low! Today I have a tutorial for you on Double Embossing. If you look closely at the bottom of my card you will see that I have embossed the bottom half using two Label 4 nesties to create an embossed focal point. I also paper pieced the dress forms. You can check out my last tutorial on Paper Piecing! 1. Using the big shot, open to Tab 1 on the platform. 2. Lay down a plate. 3. Next place a piece of chipboard or cardboard. 4. 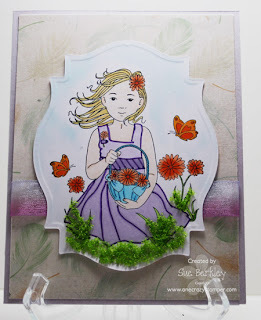 Place your No Shims Embossing mat over the chipboard. 5. The next layer is your cardstock. I used a heavy weight cardstock. 6. Place your die or dies (cutting side down). Yes, I said down. It will not cut through your paper because of the No Shims Embossing Mat. 7. Place the second plate over the dies and run through your Big Shot. Picture above shows the results. 8. I stamped my sentiment and layered it unto red cardstock, cut with the Label 4 nestie. I also added some bling. 9. Paper pieced the dress form from The Touch of Elegance Stamp set, using Kaisercraft Shaken Not Stirred dp. 10. Added a bit of lace and narrow silk ribbon. Above is the finished product! All products available at One Crazy Stamper!